Visit Palangkaraya - Friends of Borneo. Keeping it wild! Come experience one of the less travelled areas of Kalimantan which is Palangkaraya city, Central Kalimantan. The Dayak cultural influence is strongly seen in the architecture of the city from the humblest of homes to the grand Dayak hall. Things to do in Palangkaraya must include a Kalimantan boat cruise to Sebangau National Park, home to one of the biggest orangutan populations in Borneo which provides safe forests for them. Notable Events in Palangkaraya 2017. The biggest extravaganza of Dayak culture takes place every May with the Isen Mulang Dayak Cultural Festival. Get up close to nature in Sebangau National Park, Central Kalimantan with our friends at Sebangau Destinations. The Sungai Koran area in particular is the site of multiple orangutan releases in 2016. Although the sighting of wild orangutans is not guaranteed, a day trip into Sebangau National Park is a must-do when in Central Kalimantan. Overnight stays in a village is also available should you wish to spend more time in the area. We are giving away one coupon every month for a free overnight stay in Sungai Koran. See below for more details! ​Your local guide will show you the best places to see wildlife in this huge national park that covers over half a million hectares! For more information on getting to Palangkaraya city or assistance with your travel bookings, please contact us or email visit(at)friendsofborneo.org. We hope to see you soon! There are different points of entry into Indonesia where visa free entry is facilitated. If you are coming from Kuching, Sarawak, then Pontianak( Supadio International Airport ) would be your point of entry to Indonesia. Direct flights from Pontianak( Supadio airport ) to Palangkaraya( Tjilik Riwut airport ) are limited so check airline schedules carefully to allow yourself adequate time to clear immigrations before boarding your flight to Palangkaraya. An alternate visa free entry point is of course Jakarta airport, Soekarno-Hatta International Airport. Direct flights from Jakarta to Palangkaraya are available. We strongly recommend you check Garuda Airlines for flights available. If you have other questions, please do not hesitate to email us. We'd be more than happy to help cos we want to see you in Palangkaraya! 2. Confirm that you have either made travel plans to Palangkaraya, Central Kalimantan, or will be doing so within the next 6 months. 3. Confirm that your travel party is a minimum of 2 persons and a maximum of 3 persons. The coupon is good for only 3 persons maximum. 4. Commit to sharing your experience in Sebangau National Park publicly on social media or other public online platforms. 5. Hotel pick up and drop off on your visit date includes only from Hotel Fairuz, Palangkaraya or Luwansa Hotel, Palangkaraya. We recommend Hotel Fairuz for their strong support of Sebangau National Park. Pick up and drop off from locations other than these two hotels will incur an additional charge of 150,000 IDR payable to your guide. -This coupon giveaway is open only to non-residents of Indonesia. -Each coupon has a value of USD150.00 but has no cash value. Additional guests can be accommodated by purchasing a discounted package directly from our local guide. -Coupon does not include travel costs to Palangkaraya city, Central Kalimantan, Indonesia. 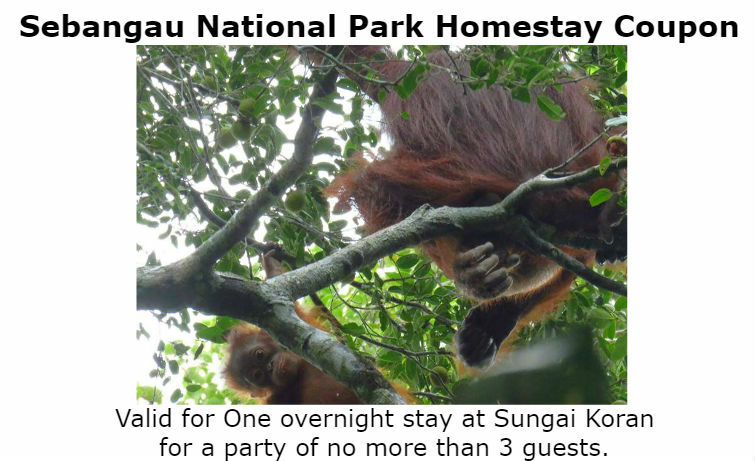 -Coupon use is only for described activities including guided tour of Sebangau National Park and one overnight stay in Sungai Koran village. -Winners of coupons will be notified by email and a digital copy sent. You can only claim your coupon upon arrival into Palangkaraya, Central Kalimantan. Our guide will validate the coupon and arrange a suitable date for your visit. -Issued coupons that are not claimed and validated by our guide in Palangkaraya will become null and void 6 months after you receive our email notification of your awarded coupon. -By choosing to accept the awarded coupon, you will be agreeing to let Friends of Borneo and Sebangau Destinations to share images of you and your guests publicly on the internet. -By choosing to claim the awarded coupon, you acknowledge and accept the fact that the awarded coupon involves travel on water in a sampan/perahu and is fully aware of the dangers associated with visiting a wild, watered area in Indonesia and that you and your friends are wholly and absolutely responsible for your own health and safety. If you agree to these terms and conditions, then get started and enter your submission to the Sebangau National Park giveaway by sending us an email on why you should win the giveaway coupon! If you do not hear from us within 24 hours of your sent email, give us a shout on our facebook page Friends of Borneo!